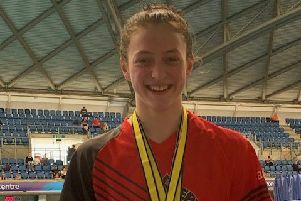 Mollie Allen led the way with four gold medals as City of Peterborough Swimming (COPS) members raced at High Wycombe’s 50m pool at the weekend looking for national championship qualification times. In total the 23-strong COPS squad won 32 medals with 15 of them gold. Allen (19) won the 50m and 100m freestyle, 50m backstroke and 50m fly and also claimed a silver medal in the 200m individual medley event. Two swimmers each took a hat-trick of gold medals. Amelia Monaghan (15) won the 100m and 200m breaststroke and 400m individual medley and added a silver to her haul in the 200m individual medley. Rebecca Burton (19) won her three gold medals in the 50m, 100m and 200m breaststroke events and picked up a bronze medal in the 100m fly. Herbie Kinder (15) won a brace of gold medals in the 200m free and 200m backstroke events, a silver medal in the 200m individual medley and a bronze in the 100m back and freestyle. COPS other gold medallists were: Henry Pearce (15) in the 400m free plus a silver in the 400m individual medley; Bethany Saunders (18) in the 100m back plus a silver in the 200m back; and Sophie Griffin (13) in the 100m backstroke event. COPS other medallists were: Lauren Harrison (16) silver 200m breaststroke, bronze 100m breastroke; Harry Whiteman (17) silver 400m individual medley, bronze 200m fly; Anna Blakeley (15) silver 50m free; Thomas Wiggins (18) bronze 200m breaststroke and individual medley; Matthew Gray (17) bronze 100m backstroke. Also swimming for COPS at the Wycombe meet were: Hannah Daley (13), Kiara Kovacs (13), Daniel Leigh (18), Emma Leslie (16), Yasir Naimi (17), Matthew Newson (14), Matthew Rothwell (15), Harriet Salisbury (13), Kenzie Whyatt (15), Matthew Wouldham (16) and Eve Wright (14).